It is served from 08:00 to 11:00. - Check in from 2:00 pm // Check out until 12:00 hours. Located in the main building, our double room stands out for the comfort and spaciousness of its 1.80m bed, it is the perfect room for our couples. The room has a simple decoration and has heating / air conditioning, TV, safe, telephone and a toilet with shower and hairdryer. 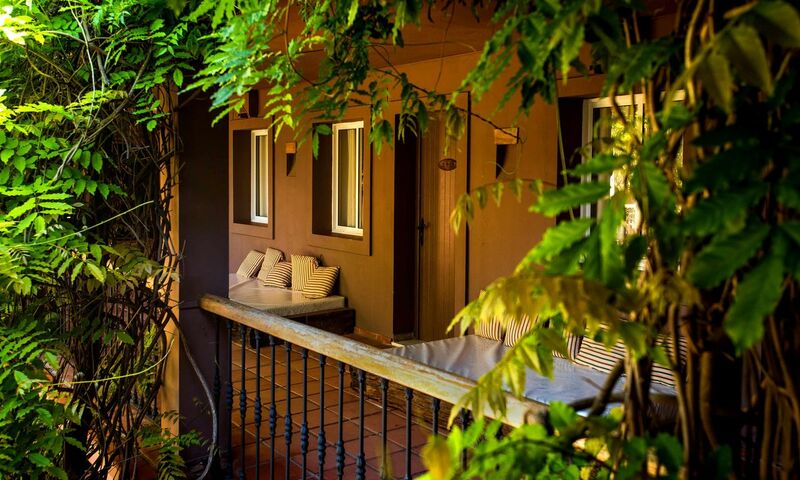 The entrance goes through a common balcony provided with chillout beds overlooking the garden, a perfect place to unwind outside the room and get carried away by the charm of our facilities. Breakfast is included in the price of the room and is served from 8 a.m. to 11 a.m. in the hotel restaurant. Located in the main building, it stands out for the comfort of its two twin beds. The room has a simple decoration and has heating / air conditioning, TV, safe, telephone and a toilet with a shower and hairdryer. The entrance goes through a common balcony provided with chillout beds overlooking the garden, a perfect place to unwind outside the room and get carried away by the charm of our facilities. Located in the main building, this room is perfect for individual use because of its comfortable 1.35 bed. The room has a simple decoration and has heating/air conditioning, TV, safe, telephone and a toilet with a shower and hairdryer. The entrance goes through a common balcony provided with chillout beds overlooking the garden, a perfect place to unwind outside the room and get carried away by the charm of our facilities. It is the only one of our rooms located outside the main building, it has an independent staircase access located on the side of the main building. It is a different room from the rest because of its location but with similar characteristics. It has a large and comfortable double bed of 1.80m and has the possibility of adding an extra bed. The room has a simple decoration and has heating/air conditioning, TV, safe, telephone and a bathroom with shower and hairdryer. Located in the main building, it stands out for the comfort of its two twin beds. The room has a simple decoration and has heating / air conditioning, TV, safe, telephone and a toilet with shower and hairdryer. The entrance goes through a common balcony provided with chillout beds overlooking the garden, a perfect place to unwind outside the room and get carried away by the charm of our facilities. The Tres Mares hotel has 24 rooms, 23 of them located in the main building, around a landscaped courtyard with colonial touches that invite you to disconnect from the routine. The hotel is located in a privileged environment, between the Natural Park of Los Alcornocales and the Natural Park of the Strait, just in front of the bay of Valdevaqueros and just a few minutes from the best beaches of Tarifa. We have a pool and restaurant to enjoy with us during your stay in Tarifa.